ACORE manufactures top quality Turbine Oil Filtration Machine TOP model, which have earned any reputation with regard to high performance, lower maintenance procedure. Our own staff has got the design as well as application experience to personalize an Oil Filtration Machine which will provide exceptional performance within your processing atmosphere. Our TOP Turbine Oil Filtration Machine sustain their overall performance in higher volume procedures, increasing the actual efficiency of the processing gear while decreasing production slowdowns and down time due to products failure. 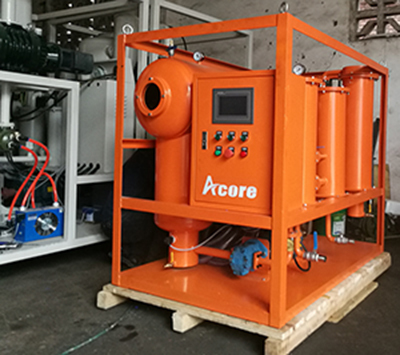 ACORE’s Turbine Oil Filtration Machine are made and produced for long lasting, low-maintenance and easy operation. TOP Turbine Lubricating Oil Filtration Machine allows you to accomplish the highest possible amounts of turbine oil purity. Our techniques combine the guidelines of quick water elimination used in the devices and the perfecting characteristics of our own vacuum dehydrators to acquire maximum generator oil program cleanliness. TOP Turbine Lubricating Oil Filtration Machine can eliminate free, emulsified, and mixed water rapidly and efficiently to improve method performance and minimize your working and maintenance expenses. 4. The Turbine Oil Filtration Machine improves efficiency of your respective processing tools and reduced operating fees for the petroleum polisher throughout its life time than regarding comparable devices. We can provide customized solutions make sure that the Oil Filtration Machine could be integrated into your own processing operations and fulfill the strictest filtering requirements.